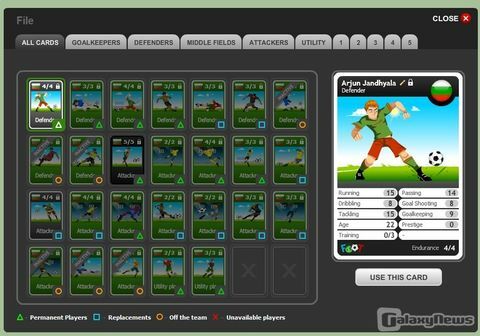 MondoFoot is a football simulation online game with a great concept and interesting features. 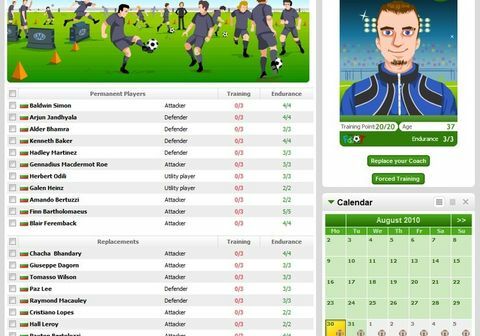 You can manage your own men, women or mixed football team and join many different competitions (National and Continental league, National Cup, Continental Cup, World Cup). When you start, you have to choose a country for your team, and create an emblem (many symbols and color combinations to choose from). You can decide whether your team should be male or female or mixed (female and male players are equally strong in this simulation game) and whether your team's strategy is rather offensive or defensive. Type in a name for your team and you can start! 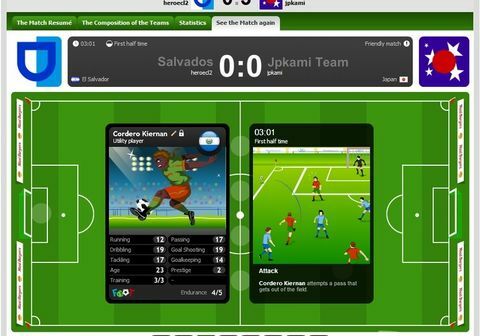 On your homepage you will find a link to the game rules which are quite detailed and all is well explained. The game is based on a card system. There are more than one million unique cards that represent your players,designed especially for MondoGames, action cards and boosters to help you impact the result of a game and bonus cards that give bonuses on the skills of players and so on. You configure and train your team, buy new players or trade cards with the other players using the exchange system. One of the great features about this game is the ability to watch and monitor your matches and make changes to your team during the half-time. It is also possible to make settings for automatical replacements and more. 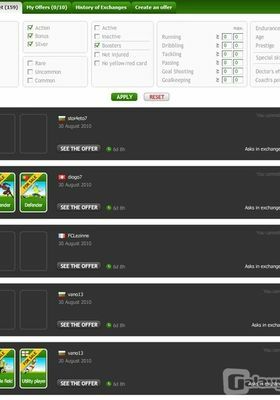 MondoFoot is basically a free game but if you want to improve your team you can buy more cards with Mondoz (virtual money common to all the games of MondoGames). There are also other possibilities to get new cards. You can win success points in all competitions or you'll get them via events. The success points can be exchanged in the success shop for better and helpful cards. And you can buy common player cards on the cards market. Another popular way for getting players,boosters and action cards is the exchange system between players. Create a team with just a few mouse clicks and join the football sensation of the year!